This high quality touring kit fits all 200cc engines. It features aluminum fins for optimum cooling and expansion properties, a reboreable cast iron liner, four transfer ports for improved power throughout the rev range, stage 4 intake and exhaust port timings for improved high RPM performance, and a high quality Asso piston with two 1.5mm rings for high RPM durability. The kit accepts standard intake and exhaust manifolds, and more power is obtainable with a larger carb (up to 35mm) and expansion chamber system (delivering 13-18hp), while maximum power (comparable to the TS1) is obtainable with reed valve manifold #472.A and additional boost port (#0250.D7A). For use with a reprofiled 200cc cylinder head (not included). Includes a 70mm Asso piston with standard skirt length, so monstrous low RPM and midrange torque can be had using any carb from 22mm-35mm and either a large bore exhaust or an expansion chamber. 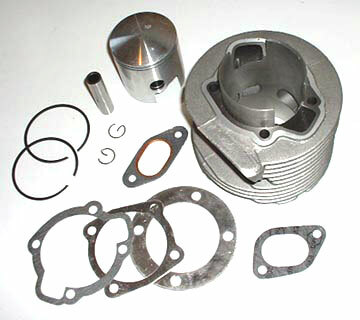 Complete kit includes piston assembly and all necessary gaskets. 0301.EI GP200 LARGE BORE MUFFLER-S.I.L. 0302.DI GP200 LARGE BORE U-BEND HEADER TUBE-S.I.L.